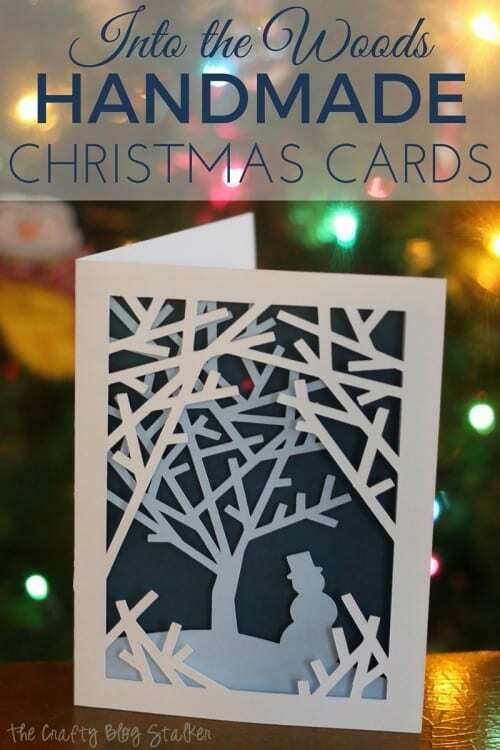 Do you make handmade Christmas Cards to give to friends and family? It is one of my favorite holiday traditions. I hope by sending cards that I touched and made with my own two hands I am showing how much I love and care for all of those wonderful people in my life. This year for my holiday cards I found a super cute file in Cricut Design Space all I had to do was cut and assemble. 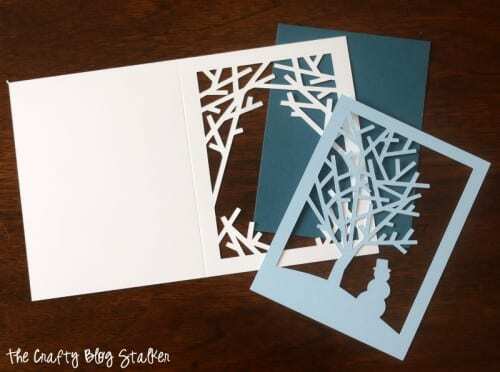 The file is called Into the Woods Holiday Card, and it is really so easy to recreate. It is intended as a print and cut file, but I used a solid color of cardstock on the back, instead of the printed version and I absolutely love how it turned out. Here are the different layers cut out. 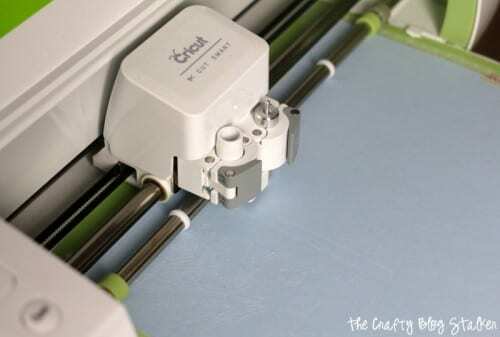 The Cricut will cut out the white and light blue pieces. I cut the dark blue piece to 5 1/4 x 4 7/8 inches. Start with the light blue piece. 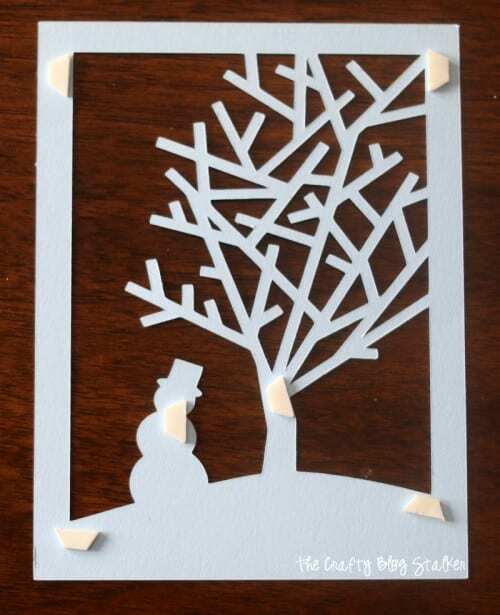 Have the piece facing down so the snowman is to the left of the tree and apply foam dots to the corners, as well as on the snowman and tree trunk. Remove the paper backing to the foam dots and apply the dark blue piece, centering it on the light blue piece. Turn the pieces over so the dark blue is on the bottom and the snowman is to the right of the tree. Apply more foam dots around the edges only of the piece. 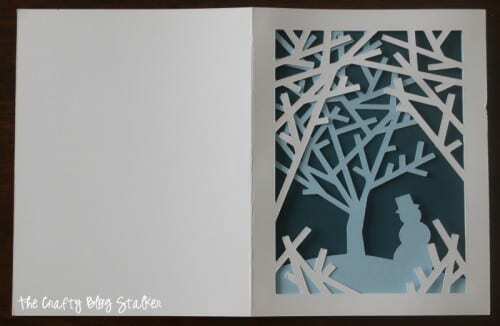 Remove the paper backing of the foam dots and carefully center the open window of the white card base over the winter scene. That’s all there is to it! I told you it was super easy! Write your heartfelt message inside and the card is ready to be dropped off in the mailbox. If you are mailing your cards, make sure to get them in the mailbox by December 15 so they’ll be delivered by Christmas! 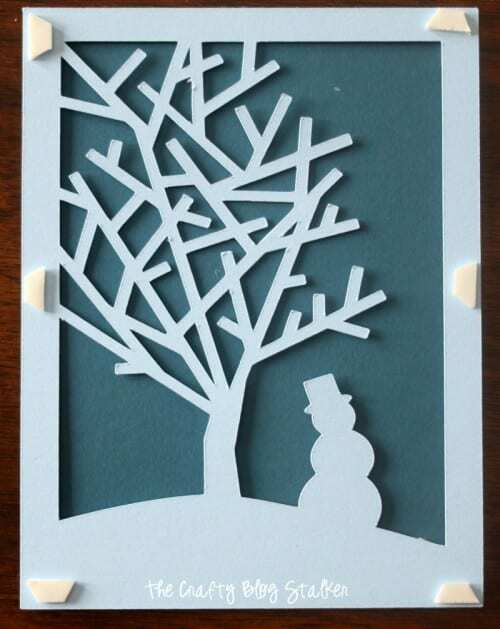 Do you send handmade cards, store bought, or don’t even bother with cards? Share and leave a comment below. 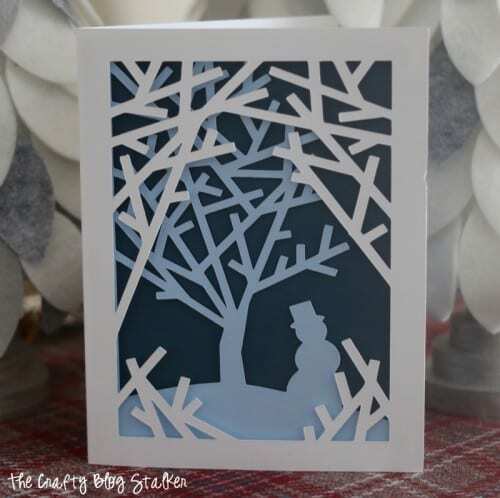 SAVE HOW TO INTO THE WOODS HANDMADE CHRISTMAS CARDS TO YOUR FAVORITE PINTEREST BOARD! Ah, I think I saw these on instagram earlier in the week, they are really beautiful, love them. Wow, these have turned out so well. Really pretty. This came out beautifully! I’m loving playing around with my new Cricut Explore for holiday cards this year! The card is stunning! I have always enjoyed receiving hand made cards for any occasion. Hopefully soon (when we get our new house built) I will have the time and the space to make such creations myself! Thanks so much for the tutorial! Handmade cards are getting harder to find. You’ve created a lovely one! Thanks for sharing the instructions on Funtastic Friday! Thank you Heidi! I am so glad that you like it!